Provides complete transformer fault protection, overload protection, fault oscillography and transformer monitoring with one integrated technology. Five sets of CT inputs for differential protection. 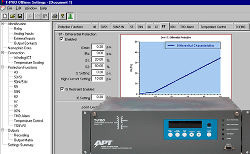 Software control adjusts current magnitude and angle. Asset management to maximize use of transformer capacity (ANSI/IEEE C57.91-1995). High quality recording — fault recording (96 samples/cycle), trending and event logging. Optimize transformer loading: adaptive overload, controlled load shedding, 30 day load trend, transformer overload early warning system, predictive 15 and 30 minute alarms. Protection functions include IEEE devices 87, 87N, 49, 50/51, 50N/51N, 59FI/59FT, 59N, 60, 67, 81, THD, Temperature Control and TOEWS.